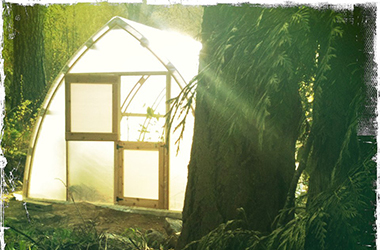 Stemming from years of construction and organic gardening experience, we design, craft and install quality greenhouses. 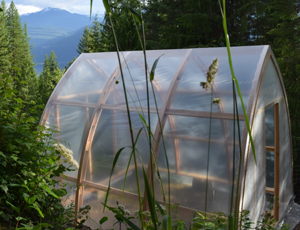 Our greenhouses are made to order using locally sourced western red cedar and B.C. douglas fir. 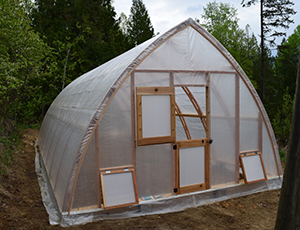 Designed to withstand the elements, our greenhouses provide an optimal growing environment for your plants and crops. 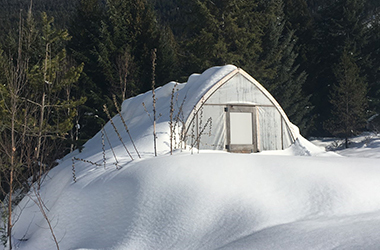 The high-arch design of the greenhouse draws on Gothic architecture and provides a durable structure that encourages condensation run-off in the summer and effective snow shedding in the winter. Using the Gothic arch design is an effective use of structural materials, making it an environmentally sustainable choice. 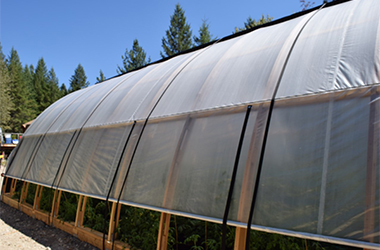 We offer four different options to use as a covering for your greenhouse, ranging from a standard soft plastic to a rigid twin-walled polycarbonate. 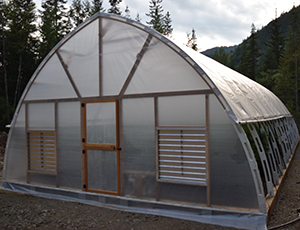 To ensure proper airflow and to regulate the temperature in your greenhouse, we offer a variety of different ventilation systems. This system is ideal for those seeking to induce and maintain the flowering cycle of plants and crops. 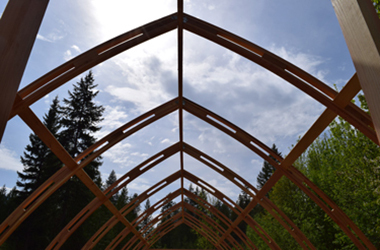 Our greenhouses are constructed using locally sourced western red cedar and douglas fir. 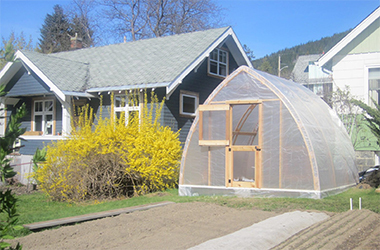 We offer various sizes and models to meet the individualized needs of gardeners and growers. 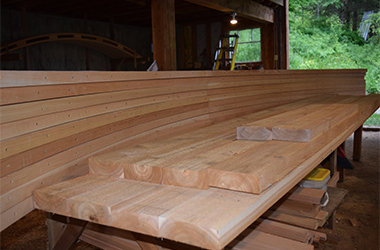 Our standard sizes, in width, are 12’, 16’ and 24’. 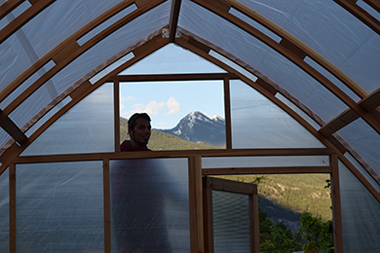 Automated and manual light-deprivation systems are available for all sizes. Yunjie G - Argenta, B.C. We are very happy with our 12’ x 12’ greenhouse! It is very sturdy, surprisingly spacious and I am happy that I don’t need to take it down for the wintertime, which means plenty of winter greens for us to have. We also feel very fortunate to have worked with Davide. He was very skilled, patient and generous with us. Overall, he made sure that we finally have our dream greenhouse. 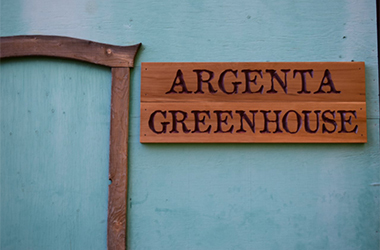 Davide at Argenta Greenhouse did an amazing job on my greenhouse. He delivered it himself to California and installed it within a week. He even had to do most of the work in the rain! I can’t wait to start using it in the spring. Heather I - Nelson, B.C. Super positive experience dealing with Davide, a great team to have on the land, efficient and beautiful and intelligent design. I love my greenhouse!